1. Today this is the mouth of the Indus river, which is a delta. But on both Reinal's and Milne's maps, it is marked by a wide gulf. 2. A large bulge that in both Reinal's and Milne's maps replaces the Kathiawar peninsula that exists today. 3. An island (or island-group) which is depicted on both maps but which does not exist today. 4. A gulf which on both maps is much smaller than the Gulf of Cambay that exists today. 5. 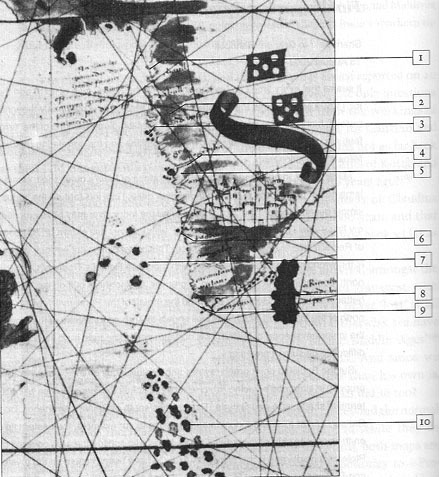 A large island (or island-group) which is depicted on both maps but which does not exist today. 6. 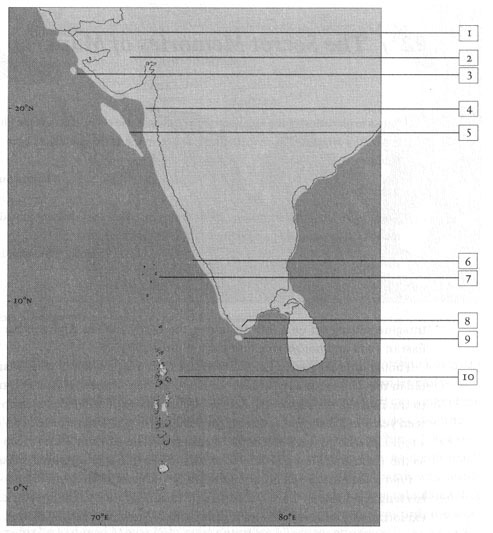 An island at the same latitude as the northernmost Lakshadweep island (approximately 12 degrees north) is shown on both Reinal's and Milne's maps. No island exists there today. 7. The Lakshadweep islands, which exist today but which are enlarged in both Reinal's and Milne's maps. 8. The tip of the sub-continent. Both maps show the tip of the sub-continent somewhat like a bay, wide but not deep, facing south-west towards the northern Maldives - very different from the south-east-facing tip that exists today. 9. A tiny island which is depicted on both Reinal's and Milne's maps next to the southern tip of the sub-continent. No island exists there today. 10. The Maldive islands, which exist today but which are enlarged in both Reinal's and Milne's maps.